Set of supplementary test cards for Visa acquirer device compliance testing in the US region (contact & contactless). 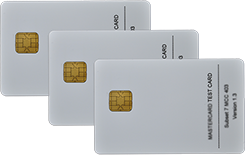 The Visa US Debit test cards kit is a set of supplementary test cards applicable to the the US region to monitor chip acceptance of a card with the US Visa Debit Common AID at all US POS and ATM environments. The Visa US Debit test cards shall be used in the US region in addition to the CDET and ADVT card decks. The Visa US Debit test cards kit is a Visa Confirmed Test Tool. It can be used for Visa certification testing of any type of contact and contactless terminal, POS or ATM. The card-terminal transaction logs are simply retrieved using card log software and a PC/SC reader.